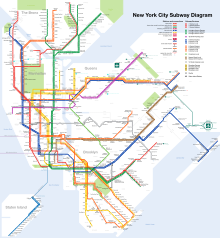 ↑ "Subway and Bus Ridership Statistics 2012". New York Metropolitan Transportation Authority. สืบค้นเมื่อ April 2, 2013. ↑ "Facts & Figures". www.nycsubway.org. สืบค้นเมื่อ December 21, 2011.